Victor Espinoza celebrates atop American Pharoah after winning the 147th running of the Belmont Stakes at Belmont Park on June 6 — the first Triple Crown win since 1978. 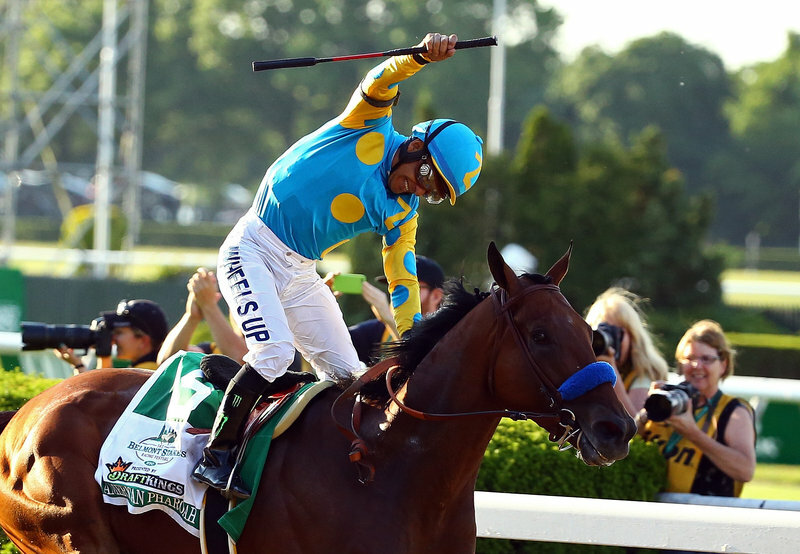 The 37 year drought for the Triple Crown is over after American Pharoah won the Belmont Stakes on Saturday. American Pharoah claimed one of the sporting world’s rarest feats. American Pharoah became the 12th horse and first horse since Affirmed did it in 1978 to win all three legs of the Triple Crown. American Pharoah won the Derby by only one length but dominated the final two races, winning the Preakness by seven lengths and winning Saturday’s Belmont Stakes by 5 ½ lengths. “Wow! Wow!” jockey Victor Espinoza said after crossing the finish line. “I can only tell you it’s just an amazing thing. It’s just unbelievable how things work out.” Espinoza ended his own frustrating drought by winning the Triple Crown. Espinoza won the Crown after failing to win it in 2002 and last year on California Chrome. Espinoza became the first Hispanic jockey to win the Triple Crown.